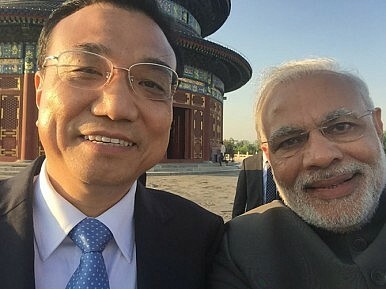 Modi's selfie with Li Keqiang during his 2015 trip to China. Plus, Russia and Pakistan jet talks, India’s new assault rifle, and Xi Jinping’s pop culture knowledge. Links. Turnbull pushes the envelope on South China Sea. Australia’s new prime minister, Malcolm Turnbull, who took over from Tony Abbott after an unexpected intra-Liberal Party leadership vote, has found that navigating Asia’s geopolitical fault lines harder than it appears. Turnbull remarked that Beijing’s “pushing the envelope in the South China Sea has had the consequence of exactly the reverse consequence of what China would seek to achieve.” The Chinese government fired back, expressing its hope that Australia under Turnbull “will stay committed to not taking sides on issues concerning disputes over sovereignty.” Turnbull’s remarks raise the matter of whether we’ll see more change or continuity in Australia’s approach to China and Asian flashpoints with him in charge; Abbott’s Australia had avoided miring the country at the center of Asian disputes. India’s assault rifle plans go indigenous. New Delhi recently canceled a $1 billion tender for some sorely needed assault rifles for its infantry. Defense News reports that India will hold trials of its home-made Excalibur assault rifle. Per the 2011 global tender, the Indian Army was looking 66,000 assault rifles. If the Excalibur is selected, it would replace the aging Insas assault rifle. The Insas has been the subject of much criticism from Indian soldiers. Is Pakistan really getting Su-35s? Islamabad recently concluded a deal with Moscow to purchase several Mi-35 Hind attack helicopters. Later, reports emerged out of Russian state-owned press that Pakistan and Russia were in negotiations over a possible Su-35 sale. If that sounded unlikely to you, you’re not alone. Several analysts express skepticism that Su-35 Flankers will find their way into the Pakistani Air Force. Xi Jinping: pop culture aficionado? Wondering why Xi Jinping would choose to reference popular Netflix series House of Cards in his speech in Seattle? The Diplomat‘s Shannon Tiezzi and Jeffrey Wasserstrom take a look at why Xi Jinping loves to make himself appear pop culture savvy over at Slate. Japan-India Maritime Exercise 2018: Operational Clarity, Strategic Confusion?What Does the Modi-Xi Summit Mean for Sino-Indian Relations?With Military Parade, Pakistan Sends Message to India, TalibanRussia Completes Delivery of 24 Su-35 Fighter Jets to ChinaWhat Did India’s Foreign Secretary Achieve on His Trip to Russia?